The United States urged political parties in Sri Lanka on Friday to abide by the Constitution and refrain from violence, as the island nation faces a constitutional crisis after its president ousted the prime minister. Controversial Sri Lankan strongman Mahinda Rajapaksa staged a dramatic political comeback on Friday, becoming the new prime minister after President Maithripala Sirisena sacked premier Ranil Wickremesinghe who termed the move as 'unconstitutional' and vowed to prove his majority in Parliament. In its first reaction to the unfolding situation in Sri Lanka, the US State Department said it is following the development in the island nation. 'We call on all parties to act in accordance with SL's Constitution, refrain from violence, and follow due process,' the State Department said in a tweet. 'We expect gov of SL to uphold its Geneva commitments to human rights, reform, accountability, justice, and reconciliation,' the South and Central Asia Bureau of the State Department said. 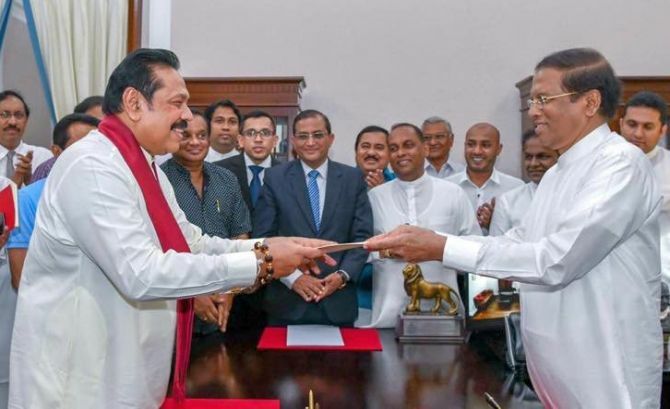 The move that took Sri Lanka by surprise came amid growing tensions between Sirisena and Wickremesinghe on several policy matters even as the President remained critical of the Prime Minister and his policies, especially on economy and security.